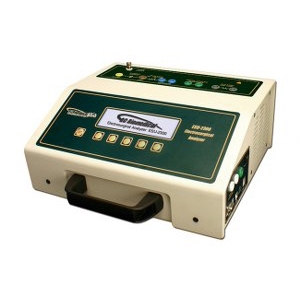 The ESU-2300 is an Electrosurgical Analyzer. The “measurement engine” of the ESU-2300 is a specially-engineered true-RMS RF ammeter and wattmeter, designed to measure the complex RF waveforms produced by electrosurgical generators. The ESU-2300 has been designed to comply with electrosurgical manufacturer industry standard current sensing technology and utilizes an internal precision RF Current Transformer. The analyzer utilizes a precision internal test load resistor network. The ESU-2300 is intended to be routinely used to measure the various parameters relating to the testing and performance validation of electrosurgical generators. DFA® Technology allows the ESU-2300 to aggressively digitize the complex electrosurgical generator waveform, analyze its components and provide accurate and stable results. It may be used as a stand-alone meter or in conjunction with a PC utilizing the optional software.